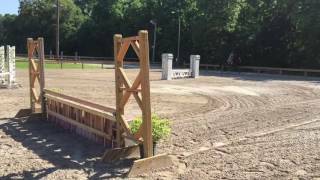 15.3h Trakehner mare. Started slowly and currently jumping 2'6" courses with lead changes. Champion and Reserve at the local A shows in the Baby Green Hunters. Free jumped to 1.20m and scope for more. Would make a wonderful Children's Hunter or Small Junior Hunter prospect. Ready to be finished in any direction you choose. Price to increase with training.